M+D Properties had a meeting on Wednesday with Gonzalez Goodale Architects, Electrical Consultants, and Bernards Construction to discuss plans and designs for the One West Green Project.Design Review Committee for the City of Pasadena had previously approved the design for the project, but with new modifications the Committee is set to finalize the new improved design. The City of Pasadena has also requested that a Public Art element be inserted in the project. M+D Properties is currently looking into hiring a Public Art manager to be in charge of this task. 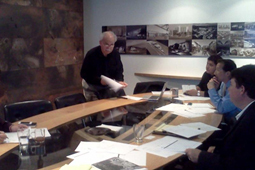 Victor from the Electrical Consulting firm also attended the meeting to assist with electrical equipment. He provided his expertise on ways to efficiently insert an electrical room to accommodate to all of the tenants at a cost effective price. Another issue that was addressed, but has not happened, was that if any party is to not attend a meeting then that party must notify M+D Properties in advance.